In November 2004 Stephen Deed presented a Master of Arts Thesis to the University of Otago entitled Unearthly landscapes: the development of the cemetery in nineteenth century New Zealand, and until recently that limited access thesis was the only major historical study of cemeteries in New Zealand. 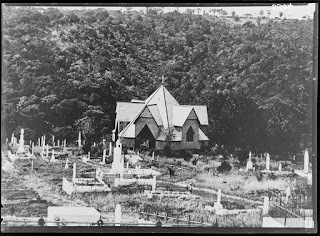 Deed has now updated and expanded on his thesis, which has now been published by Otago University Press as Unearthly landscapes; New Zealand’s early cemeteries, churchyards and urupā. Deed’s book covers traditional Māori urupā, Pākehā influenced Māori burial places, early Pākehā and Church Mission Station burial grounds, and urban and rural cemeteries of the nineteenth century. He also makes a distinction between what he terms ‘first generation’ cemeteries such as Bolton Street (Wellington) and Symonds Street (Auckland) and ‘second generation’ better planned cemeteries such as Southern Cemetery (Dunedin) and Waikumete Cemetery (Auckland). The book is very well illustrated. 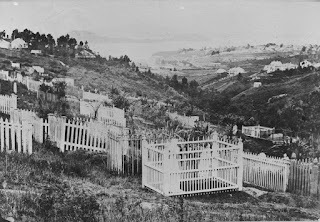 Ref: James D Richardson, Panoramic view from Symonds Street Cemetery, 1868?, Sir George Grey Special Collections, Auckland Libraries, 4-319. Much of Deed’s research has been in the Otago area, and he relies in part on the late Margaret Alington’s Unquiet earth, (written in 1978) for backgrounding the Wellington area. However, as someone who has undertaken a lot of work documenting Auckland's Symonds Street Cemetery I found some difficulty incorporating Symonds Street Cemetery into the discussion. This is likely because of varying regional approaches to the development of cemeteries before the 1882 Cemeteries Act. Ref: James D Richardson, Bolton Street Chapel, Wellington, c1930, Sir George Grey Special Collections, Auckland Libraries, 4-5304. One issue remains unresolved. Was Symonds Street Cemetery an example of the 'picturesque' or the 'formal' or did it just grow? Some commentators opt for the 'picturesque', while Deed points to a lack of cohesion in its development. I am more inclined to agree with Deed. For those interested in particular cemeteries, there are now some conservation plans available along with registration reports for the New Zealand Historic Places Trust. Symonds Street Cemetery has one of each. Mr Deed is very selective in the ‘contemporary’ written and pictorial descriptions that he quotes to support his argument that there was no [New Zealand] cemetery ‘planned on purely picturesque lines.’ The opposite can be argued through the ownership of a well-worn copy of one of the staunch advocates of the Picturesque, Sir Uvedale Price (1747-1829). His 1842 and second edition ‘On the Picturesque’ [edited by Sir Thomas D. Lauder] was a personal gift to Bishop GA Selwyn by the woodcut artist of this new book, Mr Montague Stanley (1809-1844). The original well used book can be read in the John Kinder Library, Auckland. Reversing Deed’s inland focus of the historic photographs of Symonds Street cemetery he selected and redirecting the gaze in the other direction (towards the Waitemata harbour) will picture a deep wooded ravine or gully (of Grafton Gully) – with some weeds and a stream flowing here - that was the preferred sublime location of a ‘Picturesque’ cemetery and this cemetery. If one reads the full contemporary description from Mrs Charles Thomson (quoted by Deed to support his non- picturesque argument) one must conclude that her field trips were restricted by a very wet May that interrupted what she could and could not view of the Church of England cemetery. Bishop GA Selwyn established an unbroken governance of the Symonds Street Cemetery through his trustees – including Dr. Charles Knight; Shirley W. Hill and George P. Pierce, who all encouraged a policy that retained the regenerating native vegetation cover by not grazing animals or using controlled fire to destroy weeds. They began to plant both native and exotic trees across the upper ridges from the early 1860s onwards. Old invoices held in the extensive Auckland Anglican Church Archives of trees purchased locally confirm these trees were actually shared with the other nearby cemetery denominations. It would be the building of the Grafton Bridge in 1908 that lead to the ‘opening’ of the Anglican cemetery with major trees (conifers) removal that allowed pasture to grow and an incorrect interpretation was later made by some Council officers that the cemetery was an example of a ‘Gardenesque’ design. I was not. It was the Picturesque (with a large ‘P’) husbandry applied from 1840 onwards with pedestrian paths laid out by the Royal Engineers of Miners & Sappers from 1853-54, with one of these paths named on official church plans (drawn by Percy Holt dated to 1887) as the ‘Bishop Selwyn Path’. 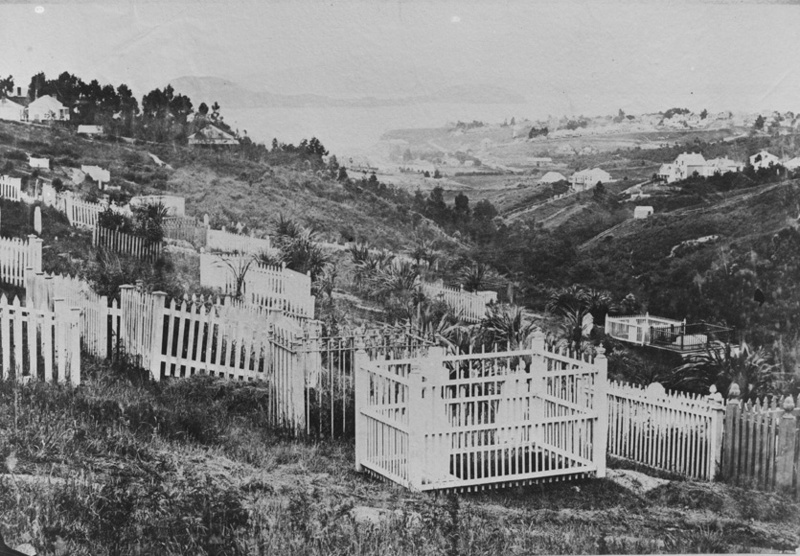 Holt was born overlooking the Grafton district cemetery and won an open landscape design competition to layout the Auckland Domain. This nearby landscape was another place where the Picturesque was also applied to create a secular Picturesque landscape of international heritage significance.